You’re probably using a stress ball wrong. But don’t worry—Mehul Mankad, MD is here to enlighten us on the proper technique for those ubiquitous foam balls. And while he was in the Listening Booth, Dr. Mankad shared what inspired him to a career in psychiatry, what’s challenging about his job, and what makes it all worth it. Dr. Mehul Mankad: Are you ready? Karishma Sriram: Yeah, I’m ready. Mankad: So I’m sitting in your booth and there’s like different stuff on the booth. And one of the things is- I’m going to call it a stress ball, even though it’s shaped like a little like Pepe Le Pew skunk. Karishma: That’s Dr. Mehul Mankad. He’s a psychiatrist at Duke. And he wants you to know, you’ve probably been using a stress ball wrong. Mankad: What most people do with stress balls is that they will just like squeeze them, like almost in a pulsatile way, like they’ll just kind of squeeze, let go, squeeze, let go, squeeze, let go. And they think that that’s doing something to help them relieve stress, because it’s called a stress ball. But that’s actually not how stress balls are supposed to work. If you squeeze it rhythmically what you’re actually doing is exercising. And so what you really want to do if you if you want to use a stress ball, is to get the stress ball put it in your hand comfortably, and you squeeze it. And you squeeze it kind of as hard as you can. So I’d say like maybe like an eight out of 10 in terms of how hard you squeeze it. And then you hold it and you hold it and you hold it and you hold it and you hold it. And what’s going to happen, is that your fingers are going to kind of cramp, and your forearm is going to burn a little bit, and it’s going to be uncomfortable. And what you need to do, is focus on the discomfort. Try to describe the discomfort in your mind. I can right now feel my second, third, and fourth fingers in this kind of like painful, kind of crampy way, and I can now feel the burning going into my wrist. And it’s not cool, like it’s not a good feeling. But then what I’m going to do when I can’t stand it anymore, while I’m maintaining that sense of focus on my hand, I’m going to let go. And then I’m going to feel what it feels like to let go. And that, my friend, is the stress relief. And let that wash over your hand, into your body, and into your mind. Karishma: This is Voices of Duke Health. I’m Karishma Sriram. 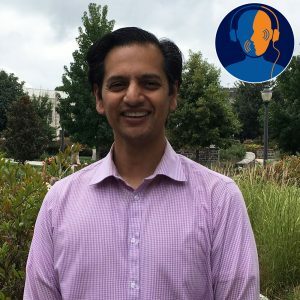 Besides being a stress ball expert, Dr. Mankad is also a psychiatrist at Duke and the Durham VA. We sat down with him and asked him to rewind a little and tell us what inspired him to be in medicine. Mankad: So I am the son of two physicians and my father’s father was also a physician. So we’ve been, I think we’ve been practicing medicine and my family for- western medicine- for almost a century. And so I was, you know, your good Asian-American kid, did well in school. Interested in the sciences, OK at math. And then was looking at colleges and I ended up in a program which was a seven year deal. And so three years of undergrad and then kind of a spot reserved in medical school for kind of the fourth- starting in the fourth year. You know, I have to like find a time machine and thank my 17-year-old self for picking this particular program that I attended. They allowed the undergrads to major in anything, as long as we maintained a certain GPA and as long as we took all the premed courses. And so I like to argue. And so I chose philosophy as my major. Trying to understand what makes us us, and the idea of consciousness and mind and body, and whether it’s dual or single, and those sorts of things just were fascinating to me. And I had this freedom to study them as deeply as I wanted, for those three years. And then I thought, well, I’ll just put that all away, that was kind of like my hobby, and go to medical school. And I did. And somehow it kind of all jelled, right, it all came together and I realized that my longstanding interest in science could be combined with my interest in consciousness and the mind, in this specialty of psychiatry. So that was like really cool and I had to- it took me like a year to figure out like, should I still be a surgeon or should I go into psychiatry? Karishma: What did that decision process look like for you? Mankad: So I was doing my urology rotation, which I absolutely loved. And I still really like surgery. I wish I could do both. But, you know, I was just thinking my goal as a urologist or urologic surgeon would be to perfect my manual skill set with specific procedures and do them over and over, and do them as well as I could. And to just kind of rinse and repeat and do that over and over again until retirement. And I’m sure there’s a lot more to being a urologist and than what I’ve described. But what I found in the same amount of time, so if I if I spent the same number of hours in the psychiatry clinic, and even if all the patients had the same diagnosis according to some manual, they were all unique. And what was so poignant and visible and clear to me, was that their lives and what was going on outside of just their symptoms, impacted the treatments we chose and how we implemented them and what helped them get better. Karishma: So in actually one of our previous conversations in the listening booth, there was a family physician named Dr. Bynum, and he said something that really stuck with me. He said that a patient and physician interaction is a relationship, it’s not just two people sitting in the room, it’s them creating a relationship. But in and of itself, it is flawed, because the patient always has to be more vulnerable than the physician. And I guess I was just kind of wondering in the context of psychiatry, patients are, I think, the most vulnerable that they would ever be with any human being, to you. How vulnerable do you allow yourself to be with them? Or where do you draw that line? Mankad: Oh, that is one of our favorite questions in psychiatry. Yeah, like do you have an hour? Because we literally teach, you know, year-long courses just to try to address that question. One of my mentors when I was in training said that all physicians and probably all nurses, times like 10, used their own emotional state as both a barometer and as a tool to help people. But that is reinforced in the field of psychiatry. It’s the field where your emotional state and that connection with the patient, at that level, is prized beyond almost anything else we do. And so figuring out how to walk that very special and privileged space in a way where you make it an inviting and open and safe environment for someone to be vulnerable. But then not necessarily get so sucked in, yourself, that you end up drowning in their unhappiness. That is a real challenge. Am I getting too close? Am I too distant? How do I convey to the patient that I’m here for them and that I’m friendly, but I’m not their friend. You know, I’m trying to help them get to another place, and sometimes that involves saying things, as tactfully as possible, but saying things they may not want to hear. So how to do that is a combination of kind of book knowledge and then wisdom from people who’ve been there, as therapists. Karishma: Yeah, absolutely. It’s definitely an art. Has there been a moment where you entered a conversation with one of your patients and you were like, I failed at that. That did not go well. I don’t know if I helped them. And how did that make you feel? Mankad: Oh that happens so often. Places where I wonder if I’ve helped the person that is wanting something—they often cluster around issues that a lot of us find touchy. So if someone really wants to talk to me about their concerns about race. Their concerns about gender. Their concerns about religion. How do I let them speak and make it an environment where they feel heard, if I actually hold views that are very different? And that’s a challenge. But I still want to be there for them and I still want to be their doctor. That’s hard. And so then those stick with me, and I wonder like well how can I- how can I do this better? This person literally votes the exact opposite way that I do on a ballot. But I want to be there for them. And the good news is, I can ask them, right? How’s it going? Do you think we’re doing stuff that’s helpful to you? And if we’re not, let’s figure that out. Karishma: So it’s more of a discussion as opposed to a, I guess, fictional representation of physicians, just being like, here’s your prescription for something, or this is what I’m giving you. It’s more of a shared decision process. Mankad: Okay good! So they did exist, maybe they still do, I haven’t seen one in awhile. But you know, psychiatrist is in the Yellow Pages right next to psychic, and I’m not a psychic. I don’t have a crystal ball. I don’t actually know what you’re thinking, like that’s where the words come in. Like you have to tell me what’s going on. And so I’m going to be asking, how do you think it’s going? Karishma: So in those moments where, maybe the conversation didn’t go the way you wanted, or- what keeps you going? What keeps you wanting to come into work the next day? Mankad: Yeah. Just to kind of riff off of your first point, for all of us in healthcare, you know, we’re supposed to put that stuff at the door as much as we can, before we step into the exam room, right? For the patient who’s there, they’re there oftentimes at their worst, and they need someone who’s going to bring it, right. Who’s going to be 100. Who’s going to be so fire. All right. I’m learning these words from my son. And so yes, if we had a rough morning and I got to work late, I have to do my best to not let that impact any of my patient encounters. If I have a prior patient encounter that went sideways, that really shouldn’t affect the next one. And that’s also an art and that’s also challenging. That didn’t really get it your question, and maybe, putting my psychiatrist hat on, maybe I’m stalling because I don’t want to answer your question. Mankad: Yeah. So the question was, how do I recover? Karishma: Yeah, what motivates you to keep going. Mankad: One of the three domains that people study when they do these burnout inventories is whether the healthcare provider still derives a sense of meaning from their work. And so what I can say, resolutely, is that when I am having a rough go, whether it’s in some sort of administrative task, or directly in front of a patient and things are just not going the way that either of us want them to—that when that encounter or when that experience is over, I can take a step back and remind myself that what we’re doing here and what I’m trying to participate in has value and meaning. I had no idea that is how we needed to use the stress ball. Thank you. Thank you also for reminding us that we need to keep the meaning of what we do present , especially when the burnout is trying to sneak on us.